The industry’s new best-of-breed. Our customers told us exactly what they’re looking for in a gas monitoring solution: reliability, simplicity, ease of use. The new iSeries platform delivers on all counts - and then goes a step farther. 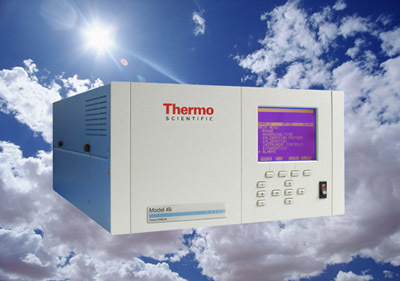 Using UV Photometric technology, the Model 49i-PS is able to produce ozone at a rate of up to 5000 ppb.The Model 49i-PS is a dual cell photometer, the concept adopted by the NIST for the national ozone standard. The Model 49i-PS can operate with ozonator flow rates of up to 6 liters a minute. Because the instrument has both sample and reference flowing at the same time a response time of 20 seconds can be achieved. Temperature and pressure correction are standard features. User settable alarm levels for concentration and for a wide variety of internal diagnostics are available from an easy to follow menu structure. This state-of-the-art gas analyzer offers features such as an ethernet port as well as flash memory for increased data storage and field upgradability. Ethernet connectivity provides efficient remote access, allowing the user to download measurement information directly from the instrument without having to be on-site. You can easily program soft-keys to allow you to jump directly to frequently accessed functions, menus or screens The larger interface screen can display measurement information and staus, while viewing menu and operational screens. For more information visit the Model 49i PS Ozone Analyzer Webpage.